She had an unusual fund of good sense, the utmost mildness and sweetness of disposition, an uncommon penetration in her ideas, and great simplicity of character. […] The sound of the voice produced the same effect on her as the physiognomy has upon persons that see. 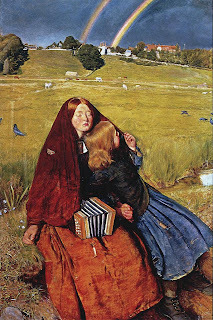 One of her relations, a receiver-general of the finances, behaved very ill to her family, in a way extremely unexpected, on winch she remarked,”Who could have conceived this with so sweet a voice!” When she heard any one sing, she distinguished between the voice of a fair and of a dark person. When any one spoke to her, she judged of their height by the direction in which the sound came. “I persuade myself,” she continued “that those who see, distracted by their sight, can neither hear nor understand as clearly as I do. Why does the elogium of music, which I hear from others, always appear to me poor and feeble? Why could I never express myself as I feel? Why, in the midst of what I would say, am I obliged to stop, seeking in vain for words which can paint the sensations I experience? Is it that no adequate words are yet invented? I cannot compare the effect that music has upon me, but to the sort of intoxication I experience when, after a long absence, I throw myself into the arms of my mother, when my voice fails me, all my limbs tremble, tears stream down my cheeks, my knees will no longer support me, I seem dying with pleasure”. She had the most delicate sense of modesty that I ever witnessed. Asking her the reason of it, “It is,” she said “the effect of my mother’s good counsels. She has said so many things to me on this subject, that I will own I could scarcely comprehend them for a long time; and perhaps, in comprehending them, I have ceased to be innocent.” She died of an inward tumour, which her modesty prevented her ever mentioning. In her dress, in her linen, in her person, there reigned a neatness, which is so much the more extraordinary, as not seeing herself, she could never be sure that she had done all that was requisite to avoid disgusting people of the opposite quality. If they were pouring out drink for her, she knew from the noise of the liquor in falling when the glass was full enough; she took her food with a surprising circumspection and address. Sometimes, as a joke, she would place herself before a glass to dress, imitating all the manners of a coquette, who is arming for conquest. This mimicry was most exact, and most truly laughable. From her earliest youth, it had been the study of all about her to improve her other senses to the utmost possible degree, and it is wonderful how far they had succeeded. By feeling she could distinguish peculiarities about the person of any one which may easily be overlooked by persons who had the best eyes. Her hearing and smell were exquisite; she judged, by the impression of the air, the state of the atmosphere, whether it was cloudy or serene, whether she was in an open place or a street; and if a street, whether it was a cul-de-sac; also whether she was in the open air or in a room; and if in a room, whether it was large or small. She could calculate the size of a circumscribed space by the sound which her feet produced, or by that of her voice. When she had once gone over a house, the topography of it remained perfect in her head to such a degree, that she could warn others of any little danger they were likely to incur. “Take care the door is too low. — Do not forget that there is a step.” She observed a variety in voices of which we have no idea, and when once she had heard a person speak she always knew the voice again. She was little sensible to the charms of youth, or shocked at the wrinkles of old age. She said that she regaled nothing but the qualities of the heart and mind. One advantage which she always enumerated in being deprived of sight, particularly for a woman, was, that she was in no clanger of having her bead turned by a handsome man. She was exceedingly disposed to confide in others; it would have been no less easy than base to deceive her. It was an inexcusable cruelty to make her believe that she was alone in a room. She was not subject to any kind of panic terrors; seldom did she feel ennui, solitude had taught he to be every thing to herself. […] Of all the qualities of the heart and mind, a sound judgment, mildness, and cheerfulness, were those which she prized the most. She would thread the smallest needle with great dexterity, placing the thread or silk on the index finger of her left hand, and drawing it to a very fine point, which she passed through the eye of the needle, holding it perpendicularly. There was no sort of needle-work that she could not execute; she made purses and bags, plain or with fine open work, in different patterns, and with a variety of colours; garters, bracelets, collars for the neck, with very small glass beads sown upon them in alphabetical characters. […] She played perfectly well at reversis, at the mediator, and at quadrille. She sorted the cards herself, distinguishing each by little marks she had formed to herself, and which she knew by the touch, though they were not perceptible either to the sight or touch of any other person. The only attention required from the rest of the party was to name the cards as they played them. If at reversis the quinola was in danger, a gentle smile spread itself over her lips, which she could not restrain, though conscious of the indiscretion.